Being accused of homicide is one of the most serious offenses you can be charged with and can have consequences that negatively impact the rest of your life. If you have been accused of homicide or murder, your entire life may hang in the balance, and you must be sure to talk with no one other than a La Plata & Waldorf homicide & murder lawyer. When facing the possibility of spending the rest of your life in prison, you want to make sure you have the best defense possible. As both a prosecutor and defense attorney, I have a great deal of experience in dealing with homicide and murder cases. During your free consultation, I evaluate the strength of the case from the prosecution’s perspective, while preparing the strongest defense possible for you. From vehicular manslaughter charges to capital murder, you can trust me to prepare a strong defense that takes into account all of the evidence that the prosecution may use. If you have been accused of murder or homicide, do not speak with anyone until you have talked with an attorney. Police investigators are well-trained in their interrogation techniques and can often obtain crucial statements that can hurt your defense. I can guide you through this process and help you avoid the traps law enforcement use. Are you living in the La Plata area and have been charged with homicide or murder? Make sure that you have the strongest possible defense. I can fight for you as if my own freedom were on the line. 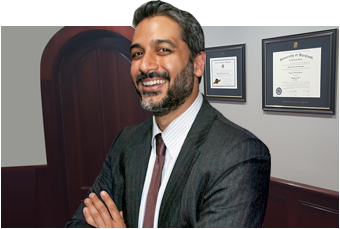 Call The Law Office of Hammad S. Matin today at (240) 776-6304 or (877) 838-4693 and schedule your free consultation with a La Plata & Waldorf homicide & murder lawyer!